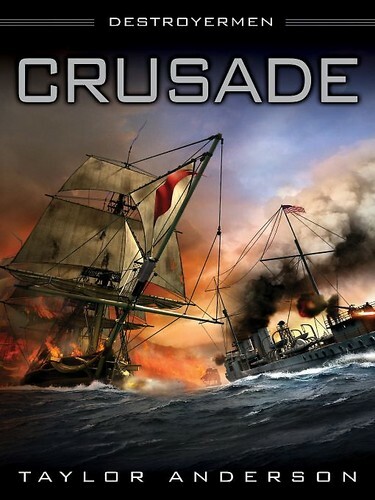 Crusade is the sophomore novel in the Destroyermen series by Taylor Anderson and a welcome addition to the story he began back in 2008. Equal parts naval fiction in the vein of Douglas Reeman, and alternate history in the vein of Harry Turtledove, Anderson has created a unique World where evolution took a right turn and chose Saurians to become the dominant species on the planet. Before we begin, a little recap. Into the Storm recounts the story of the men of U.S.S. Walker, a worn out World War One era destroyer of the Pacific fleet, fleeing the onslaught of Japanese forces shortly after the start of World War Two. Harassed by a Japanese Battlecruiser, she and her sister ship Mahan sail into a strange squall in an attempt to escape certain destruction, only to find themselves transported to what would be described as an alternate Universe, one where human society never evolved. No modern cities, no modern technology, and no humans. However, they are not alone. In a land much like Sir Arthur Conan Doyle’s Lost World, Anderson’s characters contend with deadly sea creatures that make any foray into the water a certain death, and once on shore, the danger comes in the form of many species of dinosaur. During the course of their search for human inhabitants, they come across a massive sailing vessel, home to a species of creature that resembles a walking, talking Lemur, engaged in mortal combat with what appear to be British warships of the sailing age. However, these are no English privateers they fight, but rather the saurian counterpart to the “Lemurians”, a species of sentient dinosaur modelled on the velociraptor known as the “Grik”, and exhibiting their same ferocity. It seems the Lemurians have fought a holding action against the Grik for millenia, and both societies have benefitted from previous encounters with humankind. The Grik have taken technology in the form of fighting ships, and the Lemurians in the form of “sacred” navigational charts and the language of their priestly sect … namely, Latin. Needless to say, the humans of the story are forced by circumstances and ideology to side with the Lemurians versus their common enemy while they resupply and repair their damaged vessels and decide on what to do next. In the meantime, the Americans train their Lemurian counterparts in the art of war, and attempt to advance the Lemurian’s technology to the point where their inferior numbers might be able to hold their own against the Grik hordes and maybe even go on the offensive. In the second volume the Americans have managed, through a lot of ingenuity and a little luck, to put Walker back in a fighting trim and assure themselves a dedicated source of fuel. They’re well on their way to fortifying the Lemurians against the inevitable Grik invasion and creating a fighting force of home-grown (Lemurian) troops, when a new threat arises. The Amagi, a Japanese battlecruiser, has also been caught up in the transition, and Amagi’s captain has allied his forces with the Grik. It’s an alliance of convenience to be sure, but tips the scales in the favour of the Grik. With the help of the Japanese, a massive invasion force is coming, with the expressed purpose of wiping out the Lemurian race. In a sequence of events that parallels the early stages of the war in Pacific, it’s up to the Americans and their two tiny destroyers to fight a holding action until the Lemurians can be ready for the inevitable fight. So, what’s not to like? Anderson has drafted a great tale of ingenuity against adversity, and goes to great lengths to examine the problems (and their solutions) incurred by the protagonists of the story. For instance, in this new world, there are only a couple of hundred humans, of which six or so are female. Integration with the local society becomes an issue, especially in the face of a lack of female comfort, and there’s a stirring scene in which the sailors deal with one of their own who breaks the rules of civilized society. And then there’s the problems associated with technology. The destroyers are hundreds of years in advance of any local technology, but suffer from the problems of resupply and repair. How are they to be fueled and resupplied with ammunition once it’s been expended? In a world where basic metallurgy is in its infancy and the combustion engine isn’t even a thought on the horizon, their solutions are ingenious, and at times…a little unbelievable. However, Anderson makes it work. One note of disappointment in an otherwise thoroughly enjoyable book. The Japanese characters (by the end of this book) have not been fully fleshed out, and remain caricatures, much like any of the Nazi thugs in an Indiana Jones movie. Hopefully he will expand on their story in the third volume, entitled Maelstrom. All in all, Anderson has written a page turner and taken his place amongst the greats in the genre of alternate history. As mentioned in my earlier post on his first novel, there’s a great interview with Taylor Anderson about the Destroyermen series on Peter Hodge’s website. Maelstrom is out in paperback April 6, 2010. 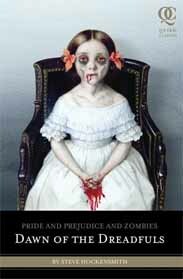 While scrolling on-line today for reviews of Pride and Prejudice and Zombies:Dawn of the Dreadfuls by Steve Hockensmith, I came across a well thought out review on Den of the Geek! From there, it was a quick jump to Quirk Classics to check out the rest of their inventory and discover that their next adorable abomination will be a new take on Tolstoy’s Anna Karenina, only with Robots! Well, androids actually, hence the title…Android Karenina by Leo Tolstoy and Ben H. Winters. I’m sure some are mortified by Quirks take on such classics, but they’re a campy and fun addition to both the Monster Mash genre and an if you look at it with the right frame of mind…an homage to the originals.